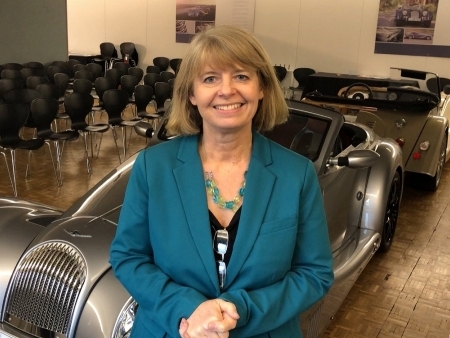 West Worcestershire MP Harriett Baldwin has this week backed the Government's drive to promote apprenticeships, meeting with Morgan Motors' boss Steve Morris to talk about the scheme. And Steve is the ultimate apprentice success story, having joined the company aged 16 as an apprentice and now holding the role of managing director. Harriett visited the company to chat to Steve and repeat her support for Morgan Motors which regularly take on apprentices, giving them vital skills in both traditional car building but also working at the cutting edge of electric car development. The company - which has been based in Malvern for more than 100 years - has around a dozen apprentices working at the Pickersleigh Road factory and is shortly planning to start looking for new candidates. Harriett commented: "Morgan Motors is a great example of a traditional manufacturing company now getting to grips with cutting edge new technology and it knows that refreshing its staff with apprentices is the best way to get a competent and motivated workforce. "The company continues to perform well and as well as selling cars all over the world, the Malvern site is a popular visitor attraction welcoming more than 30,000 car enthusiasts each year. "Morgan Motors has benefitted from Government investment to enhance its electric car capability and there are some exciting plans to deliver the new cars alongside its traditional petrol engine models. "I've offered my full support to Steve as he plans for the future and develops a strategy for the next 100 years of manufacturing in Malvern."